Elisabeth Moss checks her phone in between filming scenes for "The Handmaid's Tale," which taped on the National Mall in Washington, D.C., on Feb. 15. Elisabeth Moss stars as Becky Something in "Her Smell." AUSTIN, Texas — Elisabeth Moss wants to go to an honest place. If you can’t watch what we’re making, she says, how can you look out and confront what’s happening around you in our country and in this world? Sitting at a two-top near a hotel bar to promote the nationwide release of her indie film “Her Smell,” the conversation casually turns to the Rev. Martin Luther King Jr. As she tells it, Moss was shooting a scene at the Lincoln Memorial for the third season of “The Handmaid’s Tale” when she looked down at her feet and saw the engraved space honoring King’s landmark “I Have a Dream” address. Then, in her red handmaid’s cloak, she knelt down on the marker. Moss, who has forged June “Offred” Osborne — and Peggy Olson before her — into some of legacy television’s most notable yet unplanned feminist icons of the last dozen years, didn’t shy away from recognizing the link between the show and some of the political and social issues unfolding in the country. She even calls it cathartic. It’s noon on a sunny Saturday in early March, and the $16 cocktails are already flowing in the flora-scented hotel flooded with hipsters and people-watchers in town for the famed festival, hoping to catch a glimpse of Seth Rogen or Henry Winkler. But no one turns more heads in the influencer-heavy hotel than Moss, the brightest star at the bar, whose long blond locks tumble over a black Led Zeppelin T-shirt and matching blazer. She’s supporting two films at the festival, a standing-room-only talk with singer-songwriter Brandi Carlile (she stars in the music video for Carlile’s 2018 song “Party of One”) and an overstuffed slate of everything in between. Moss did not get a lot of sleep the night before, when Jordan Peele’s “Us” made its world premiere a few blocks away. 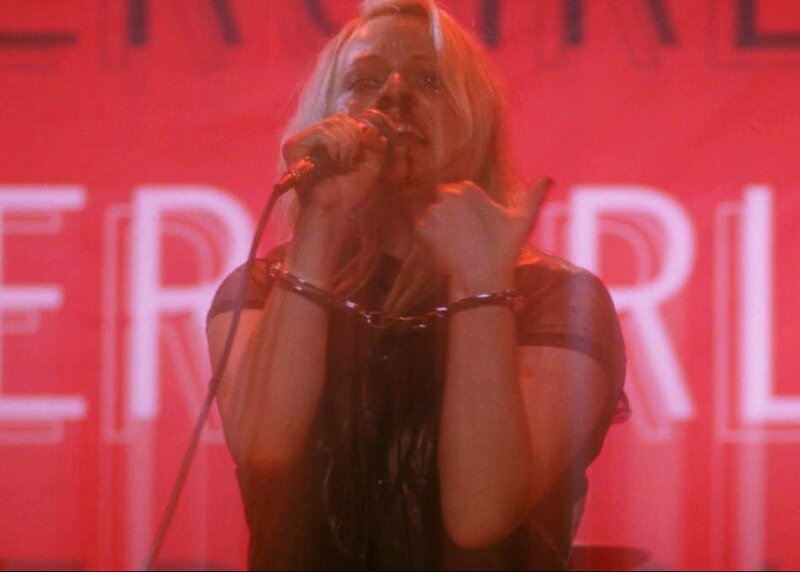 The same was true later that night for “Her Smell,” Alex Ross Perry’s addiction-fueled love letter to the highs and lows of ‘90s punk rock, that screened at the festival before hitting theaters this month. As she sips on a green smoothie, Moss swears she’s keeping it together during the weary weekend. The 36-year-old actress then wonders if she has smoothie on her face. She doesn’t. If you ask her, Moss will tell you that “Her Smell,” the actress’ third collaboration with Perry, was the hardest thing she’s ever done. The angst, anger and depression of ‘90s grunge put Moss — who grew up with jazz and blues musicians for parents and adored Paula Abdul and whose first concert was Michael Jackson’s “Bad” tour — squarely out of her element. Becky Something, Moss’s character in the fictional biopic, is the toxic, self-destructive frontwoman of the riot grrrl feminist punk movement. She is less Courtney Love and more Kurt Cobain, as well as Amy Winehouse, Marilyn Monroe and James Dean — those who struggled with a life of incredible fame mixed with crippling addiction. You can’t take your eyes off the anxiety and instability of Becky, whose jarring benders, violent outbursts and subsequent sobriety are both gripping and holistically awkward. “In one sitting, she achieves what she does season upon season on TV — creating a multiyear narrative for her characters,” Perry said in a statement. No matter how Moss got there, she left Carlile, a fan and collaborator, visibly shook. From the time she debuted on “Mad Men” in 2007 until now, heading into her third season on another critically acclaimed show and booking lead roles in feature films at a breakneck pace, the focus on the actress has never been higher. But there’s a price. With the increased spotlight on Moss and her work has come questions from fans, colleagues and critics regarding her beliefs in the Church of Scientology. She declines to expand on those criticisms but says she stands by what she describes as a personal matter. In that work, Moss’s striking range is on display throughout the weekend. One night, she’s Kitty, the vain, gossip-driven housewife who drowns her insecurities in rosé in “Us.” The next, she’s hard-living Becky. She says she played four different characters in less than five months last year, casually mentioning how she just returned from working on a Wes Anderson film in France. A weekend of standing ovations concludes with one more inside a dark ballroom at the Austin Convention Center. Fans hold out their hands and iPhones, clamoring for a chance to meet whoever they want Moss to be in that instance — the copywriter, the handmaid, the punk rocker, the star. This is the fame that follows Moss. The scene is not much different from one of the themes in “Her Smell” — the cost of fame and the sacrifices that come with it. Back at the Four Seasons, she ponders what the cost of fame has been for her. She finally lands on time, the greatest natural resource, and prioritizing it to make sure that it never becomes a cost. “My family is very important, my friends are important, my boyfriend is important to me,” she says. Then, Moss returns to an honest place.